Before leaving, Father Clemente Barron celebrated the 44th anniversary of his ordination to the priesthood with the San Antonio community this June 13th. Clemente has been a faithful member of the this community for many years. We will miss Father and wish him well in his new assignment. Willy Santiago joined the Partners making his first covenant on June 30. Along with Willy, Manolo and Lucy Razuri, Tom and Gloria Uribe, Carlos and Aurora Lopez, Raul and Dora Flores, Deacon Richard Salazar, Greg Garza and Ricardo and Beatriz Riojas renewed their covenants with the Partners. In order to make clearer the goals and publishing guidelines for contributions to the blog we will spend the next couple of blogs looking at its organization and structure. Please look at the following suggested goals and let us know what you think. For their July meeting and in preparation for covenanting this October, the Chicago Community will share their reflections on how they involve themselves in the charism, life and mission of the Passionist Congregation. In preparation for this, Father Sebastian passed out notes from the 46th General Chapter on the same. Members might want to look at four possible levels: life, action, theological exchange and religious experience. 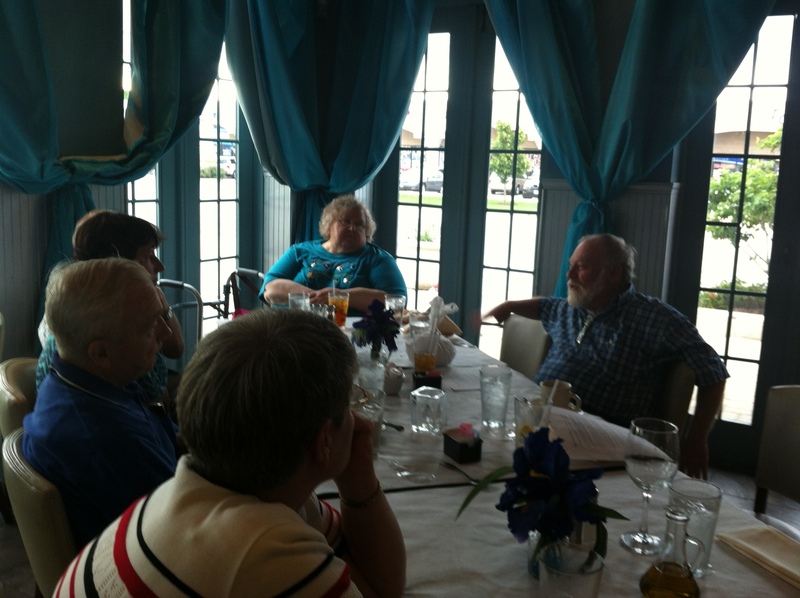 Last night seven Chicago Partners met at their usual spot, Cucina Biagio in Harwood heights for their June meeting. After a meal together each shared what has been happening in their lives since they last met. Dan presented on “Meetup” and this community blog hoping to answer any questions members had and to encourage more usage of both. “These are two ways of letting people know we exist and are meeting” Dan said. Dan encourage members to think about a meeting this Fall, where we would collaborate with other Meetup or similarly concerned groups regarding caring for the earth. He suggested Fr. Joe Mitchell C.P. presenting a session on cosmology or environmental concerns that we could podcast for use by other partners’ communities. The meeting ended with a prayer session using the daily prayer for today from the Jesuit Media Initiatives podcast “pray-as-you-go”. Over 100 Passionists (Professed and Lay) gathered in Detroit Michigan for the Annual Holy Cross Province Assembly. Members from all over the Western United States as well as from Puerto Rico, New York and even India struggled with the question of how to express our solidarity as members of a church and a world that seems so polarized and divided. How do we speak our view of truth with compassion and integrity? At the assembly, Fr. Don Senior reminded us of the tried and true biblical method of listening to minorities, the marginalized and the oppressed for clues to the above question. Fr. Robin Ryan led us in a discussion on the challenges of communion in a divided world. Books have and will continue to be written about these issues and so I won’t try to summarize either the talks or the discussions here. Fr. Robin however told a story about a family in Sandy Hook that I would like to share in this blog. The family had lost their precious Elizabeth in the school massacre. The local authorities assigned a state trooper to each family to help them through the ordeal of dealing with the press and to make sure they had all the support and assistance the community could give. The trooper assigned to Elizabeth’s family had a two year old himself at home and very much empathsized with Elizabeth’s parents. When Elizabeth’s younger brother returned to school, the trooper drove him to make sure that he would be ok. Everything seemed fine at the school, but just in case, the trooper left his cell phone number with the little boy and told him to call if he needed any help that day. Elizabeth’s brother did call and the trooper was able to help him through his first day back at school. A year later, the trooper was still visiting and assisting Elizabeth’s family. Someone asked him just how long he planned to continue helping. (He wasn’t getting paid for his time with the family by then). He answered I will stay with Elizabeth’s family until they introduce me to Elizabeth in heaven. It was great to see so many long time friends and the input was tremendous. I could never do justice to the entire experience and hope there will be more material available to share in the future. I would like to share the main thought I came away with however. There are many marginalized people today who many institutions seem reluctant to walk with now, let alone until we get to the other side. If this is going to happen today, it will be individuals, individual Passionist, individual people of compassion who will walk with the marginalized, the oppressed and the outcasts as they bear their burdens, their crosses. We can’t carry their cross for them, but we can be there doing for them what they can’t do for themselves and witnessing to the love that binds us all together as one. Jesus has shown us the way to the Promised Land, and mysteriously it seems to be the way of the cross. We lift up the cross not to shirk our human responsibilities, but because the cross is the way to the Father, to life not just in some unknown hereafter, but to life today and forever. Finally I invite other attendees as well as blog followers to share their reflections by making a comment below. Partners were able to caucus and committed to using this blog to let all the communities know what has happened and what is in the works. Thank you in advance for your participation. To communicate or not to communicate, that is the question. Members of the Holy Cross Province are gathering in Detroit next week for their annual meeting. Besides professed members, some of the lay members of the CPP will be joining them. Hopefully, this will be an opportunity for CPP’s to meet and talk about our future. I think uppermost on many of our minds, is how we communicate, and so the above poll. Please take the poll and add any comments regarding the poll question or other concerns you would like to raise. Thanks for your participation. Author CPPPosted on June 13, 2013 June 12, 2013 Categories Uncategorized1 Comment on To communicate or not to communicate, that is the question. By clicking on the following link you can read Arianna Huffington’s commencement speech to 2013 Smith College graduates where she talks about her new definition of success. Many people define success by how much money they have or how many people answer to them. Passionists don’t of course, but they do profess what she suggests as a third metric to this success formula, remembering to take care of yourself by getting enough sleep, staying connected to yourself, being able to wonder and have compassion. Of course she does this much better than my few words here. Enjoy her articulate proposal and let us know what you think.